Wing Gundam Zero Endless Waltz, also known as, Wing Gundam Zero Custom. Gundam Wing: Endless Waltz, also known as, New Mobile Report Gundam W: Endless Waltz. 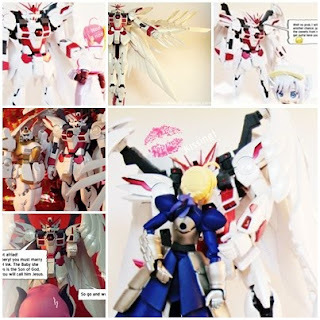 This is Wing Gundam Zero Endless Waltz Master Grade kit. Note that above is the original colour scheme which the Gundam comes in, however as I custom painted the Gundam prior to construction all the pictures in the review are of my custom colours. Wing Gundam Zero Endless Waltz (here after I will call Wing Zero) sculpt was the immediate draw for me, I have only seen some of the Gundam Seed anime series and have not seen the any other Gundam anime series, however I am a fan of the Gundam’s themselves, even if I am not a huge fan of the anime series. Any way I was drawn to Wing Zero because of the simple design and of course the amazing angel-like wings. As all Master Grade Gundam’s have, Wing Zero has an inner frame to which his armour clips onto, this is a great design as it allows very realistic and humanistic motion and movement to the Gundam, which I will go into shortly. Nothing much else to say about the sculpt except that he is very majestic with his sleek curved wings and dramatic armour, and I just noticed that one of his arm spikes is facing the wrong way, lol I will have to change that! A few more points of interest on the sculpt is that unlike the High Grade Gundam’s the Master Grade kits have opening cockpits with a figure inside, which was very tricky to paint as it was so small. Wing Zero also has his shoulder mounted guns which open out, and he can be shifted into his transforming pose; however his wings are supposed to be able to latch together in this pose so that they are secure, but I could not get them to do so. Constructing this Gundam was not difficult as he is a Level 2 kit and normally if you do not custom all you need to do is snip and clip together. Wing Zero also comes with stickers for his eyes and varies other areas which are green as well as some stickers of detailing and labelling and also some decal stickers. 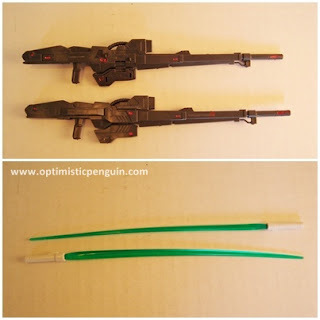 And like all Gundam’s you have to panel line yourself with your own Gundam marker or a pen of similar quality. However I did not panel line as I do not like panelling. Wing Zero’s manual is easy to follow even if you do not speak or read Japanese, like me, it is easy enough to follow along on the pictures alone. 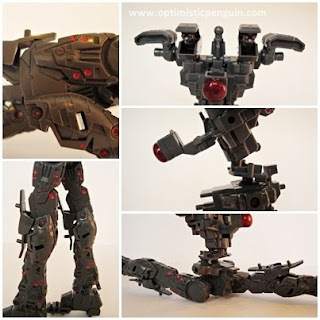 Now I am going to quickly talk about the sculpt and articulation of the inner frame. You can clearly see the joints of the Gundam in the inner frame. From the top you have the neck joint which moves the head forward and back, and when the head is fitted can rotate around on the ball peg end. Next are the shoulder joints, these move forward and back there is also the shoulder plate piece which pegs on and can rotate around. Then there is the cockpit which slides forwards so that you can peak in to see the pilot. Wing Zero then has a double ball jointed waist with a middle section, allowing him to have a range of torso movement. 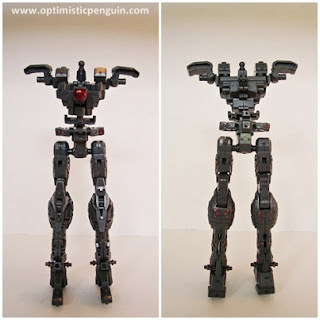 His legs are ball and socket joints allowing a good deal of motion. However he cannot turn his legs in and out much. His knees are double jointed bending at the top and bottom of the knee plate. His ankles are also double ball joints one at the leg and one at the foot, giving some nice manoeuvrability to his feet. As you can see although for the most part the inner frame is hidden I decided to do some detailing on it, just because I can. Note that I will be going into articulation and posing in more detail later on. Overall the inner frame looks great it has a level of detail which is really amazing for something which is mostly hidden; it just gives an added touch of realism to the Gundam. Wing Zero’s original paint job is dark blue plastic with red and yellow, with green sticker’s parts and plain white. All was moulded plastic so the colours were fine. 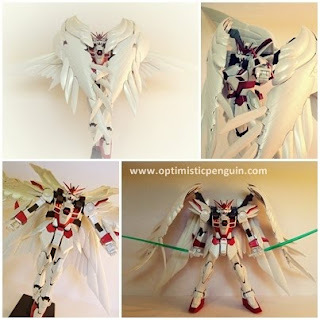 However I chose to custom paint my Wing Zero from the beginning. I will give the original paint work a 6/10 as it was mainly coloured plastic, and as I am not fond of stickers for the other parts I will not give it a higher rating. However although I was not fond of his colour scheme I got him with the aim of customizing, and so I will talk about my choices. 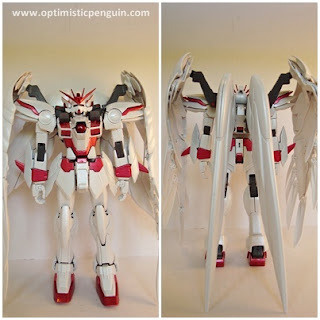 Firstly I wanted him to be very white and shiny so pearl white was my choice, after deciding on this I later found out there is a special version of Wing Zero with pearl mirror coat wings, which was funny because that was what I wanted. Anyway, I got a bunch of pearl white spray paint and began, as I did not want all of him white I played around with ideas for colours for his highlights, at first I was going to go with silver but then I thought he might look too washed out and so I went with metallic red. I wanted to keep the majority of Wing Zero white and so I only did a few places red. For his clear parts I used clear red, which gave a nice shine to his cockpit. His eyes I painted with clear yellow and they glow nicely in the light. For his head I chose to use red on the bottom and back of his antenna with red running along the top part. I also chose to make some read parts on his skirt and waist. And then some on his arms, and of course his feet. Overall I am very happy with the colour scheme and my paint job, it’s not perfect but as my first time ever using spray paints I think it was alright (only pearl which was spray, the rest by hand). There are still some places I need to touch up with pearl white but at the moment I am out of money so can’t buy any more, that will just have to wait. I am very happy with the pearl white; it gives a wonderful shine when the light hits it. I did not do any panel lining as I am not a fan of it, and I think it would ruin my sparse look. Starting at the top and working down. Wing Zero’s head is on a ball joint allowing him to move rotate it, and his neck is on a joint with moves forward and back, allowing a nice range of motion. At his shoulder he has a joint which moved forward and back, and onto this pegs his shoulder piece which can rotate around, the shoulder piece also can slide along itself (for his transformation) and has a lower piece which can be moved in and out, his arm then pegs onto the end of his shoulder joint, although this means his arms fall off every now and then when posing as they are just pegged onto the end. This piece can then rotate around and has a peg which the upper arm piece fits onto which then rotates as well. He then has a double jointed elbow bending at the upper arm and lower arm, and then his hands are on ball peg joints and can rotate. A nice thing about Gundam’s is that they don’t need extra hands as they have hinge joints on their main fingers which open and close, on the index finger, which opens and closes and the thumb is on a ball peg joint so it can move around freely. Wing Zero’s cockpit can also slide out to show the pilot inside. He then has a double waist moving at the top of his chest and at his pelvis, giving a full range of motion. His legs can move as I said before back and forth and in and out, but not much turning in and out. His skirt pieces are all on joints, the back piece on a hinge join so it can move up and down, the side pieces also move up and down, and the front pieces are on ball peg joints and can move about in order to match leg movements. His knees are double jointed, at the upper leg and lower leg and his knee plate is on a separate jointed for use in transformation pose. His ankle has ball joint at the leg and foot, and he has a front armor piece on his foot which is on a separate joint, also used to transformation pose, and what I forgot to mention before his hi front piece of foot is on a joint with points and flexes to give added movement and posing. Now onto his wings, his wings are attached to his back via a pack, and each wing is on a piece which has a jointed at the pack and at the wing. So they can move backwards and forwards up and down and can rotate to some degree. 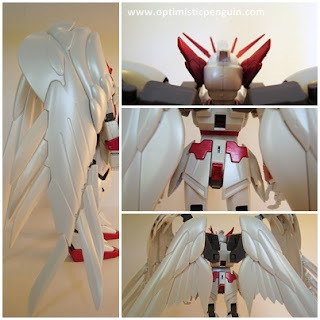 His front wings then have a piece which when moved extends the wing at the front and back, also each individual lower feather is on a ball peg joint, the ones on the back row then are on a rod which can be moved for the transforming pose. His back wings have a shaft which pulls out revealing more feathers. Overall he has very good movement. Only restrictions being his occasional falling off arms, his neck can’t look back very much and because of the weight of his wings you either need to pose him with the back ones touching the ground holding him up or straight out sideways balancing him, or you can simply have him on the stand. 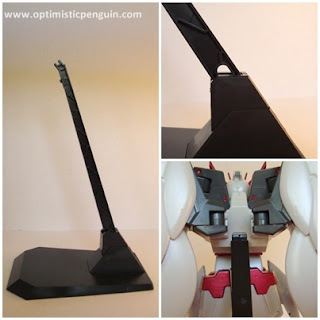 Wing Zero comes with a plain base, the base clips into the back of his wing pack, and allows to settings of angles, by pulling it out and then slotting it back down. Nothing much to say about it really, I may dress it up a bit at some point, but not now. 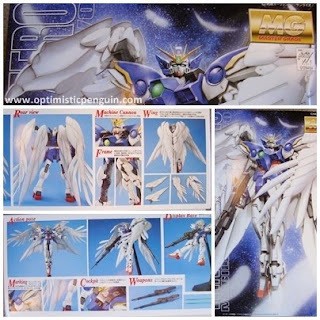 Wing Zero comes in a big box, with a nice picture of him on the front and then on the sides varies aspects of the Gundam and him posing with his accessories. Very nice design and very clear on what you are getting. Another great thing is that they give you a nice picture print of the Gundam which you could put on your wall or use as a back drop, or whatever you like. Inside the box everything is packaged well, with all the runners in plastic bags and labelled well. As I mentioned before the manual is very good, clear and readable even if you can’t read Japanese, it also features details about the Gundam and some sketch pictures of the Gundam as well as more pictures of the poses and features of the Gundam. 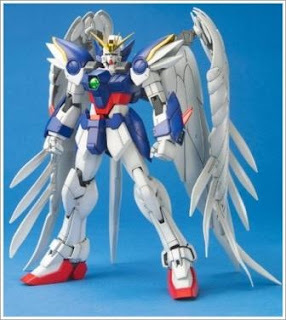 Wing Zero comes with his Twin Buster Rifle and two Beam Sabers. His Buster Rifle is good, nice detailing there are even decal to put on so you don’t get his left and right mixed up! However as the handles fold into the gun I find it hard to get him holding it securely as they keep trying to fold up when I am trying to get his hand to grip it, which is annoying. As for his Beam Sabers, they remind me of Star Wars, and they look cool, great accessory, I can see myself using them more often than his Rifle. So far I have had a lot of fun with Wing Zero, I have already got him starring in some comics and you can get him into some pretty epic poses. His posing ability is great the only complaints were mentioned before, but once you get around that he is very cool. Being my first MG Gundam I am very impressed and already have another MG Gundam on my wish list, although that one I will not custom (am over the whole custom thing now). Wing Zero is a good scale to fit in with my other figures and I am sure he will be an excellent addition to my collection. 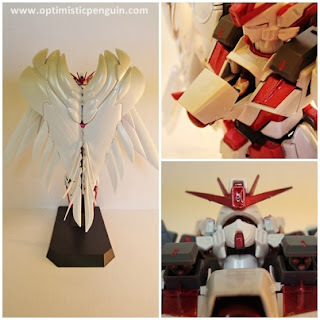 Over all I am very pleased with Wing Zero, with his design, posing, and with my custom paint. 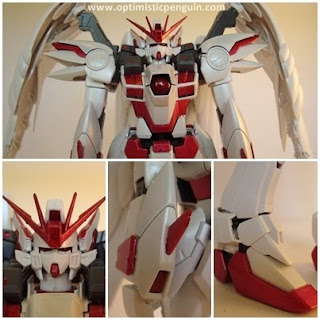 I recommend for people who want to get into Gundam Kits, and for those who like me have a thing for huge pretty wings.